FOR many years, when steamships were still in an early stage of development, they carried sails and were really auxiliary steamships. It was a long time before shipmasters and owners began to think solely in terms of steam. This attitude was due not to conservatism, but to the huge consumption of coal in steamships and also to the high standard of efficiency maintained by the sailing vessel. Such large quantities of coal were consumed by the early engines that steam was rejected by the British Admiralty because of the amount of space required for bunkers. 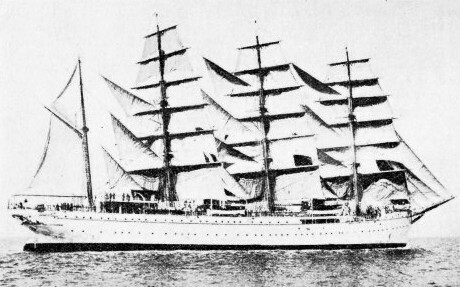 The Almirante Saldanha, a four-masted barquentine used by the Brazilian Navy as a training ship. She was built in 1933 and equipped with a 1,400 horse-power six-cylinder diesel engine by Vickers-Armstrong. The overall length of the Almirante Saldanha is 305 feet and she has a displacement of 3,325 tons. Under diesel power alone she makes 11 knots and her fuel capacity is sufficient for a voyage of 12,000 miles. It was not until the triple-expansion engine had been introduced that the steamship’s ascendancy was firmly established. As late as the ’eighties of the last century ships built in Great Britain were rigged for auxiliary sails, and during the war of 1914-18 some of these vessels emerged from retirement and played a part in carrying food. No modern steamships are equipped with sails to-day. When a vessel carries sails, her engines, not her sails, provide the auxiliary power. Such vessels are termed auxiliary sailing ships. The old auxiliary vessels of the British Navy marked the transition from sail to steam. The invention of the screw propeller was taken up by the Admiralty and applied to vessels that relied mainly upon canvas and not upon steam. Some of the ships had screws that could be lifted into a trunk built into the hull. This device enabled the retarding effect of the propeller to be avoided when the ship was under sail only. The sail-minded naval captains of the period took pride in using steam as little as possible, many of them regarding steam as a menace to the traditions of the Navy. During the Victorian era, when the Navy was not called upon to fight any great battles, sail drill was a supreme test of efficiency, and ships competed against one another for speed in setting and furling sail. Masts and yards slowly gave way to steam, although they were retained for a long while. In the latter part of the last century sloops were built with a full spread of canvas and the engines were steam auxiliaries. A former U.S. naval vessel, the Nantucket, which was taken over by the Massachusetts Nautical School as a floating academy, is an interesting modern auxiliary. She is berthed at the Navy Yard, Charlestown, during the winter, and in the summer she goes cruising. In 1933 she sailed 3,326 miles, steamed 3,572 miles and covered an additional 2,397 miles under canvas and steam simultaneously. She crossed the Atlantic and visited several European ports, including Southampton. In light airs a craft that is rigged fore and aft and proceeds under sail and power can point closer to the wind than if she were under sail only, and the sails steady a small craft in a lumpy sea. In crowded waters the skipper has to remember that the vessel must obey the rule of the road as applied to steam and not to sail. The small Dutch auxiliaries that come up London River and trade to many other British ports are noteworthy because when there is any wind they set their canvas, although a British skipper might not think the wind worth while. THE DECK OF AN AUXILIARY YACHT, the Ma Mie, built by John I. Thornycroft & Co., Ltd., at Hampton-on-Thames. This vessel, with an overall length of 43 feet, is typical of the modern auxiliary yachts which may be seen in British rivers and coastal waters. 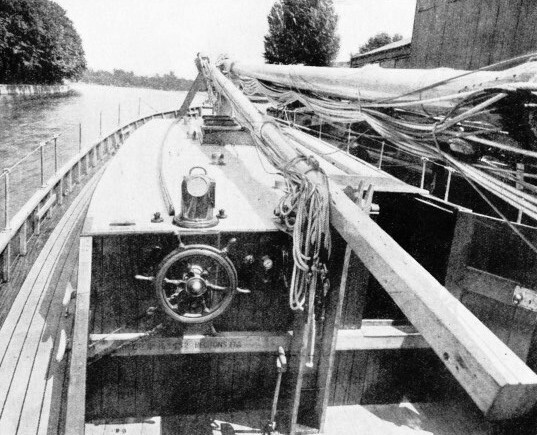 The photograph shows the engine controls near the wheel and the mast that can easily be stepped when required. Sail was a trusted reserve of power for many of the vessels that made history. The Great Britain is an example. She was the first propeller-driven ship to cross the Atlantic, and she had six masts. She was intended to be a paddle ship, but was altered while she was being built, and completed during 1843. After a period in the Atlantic trade she was sold to be fitted out for the Australian trade. 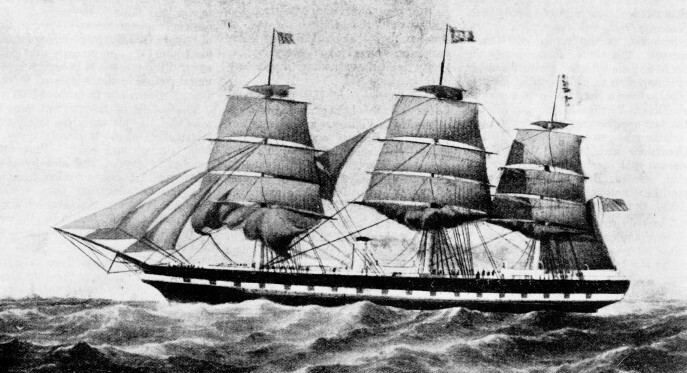 She was altered to a four-master with two funnels instead of one and she sailed from Liverpool for Melbourne in August 1852. The first iron steamship of any size, she had a capacity of 3,500 tons. On her first voyage to Australia she had 630 passengers and a crew of 137. On board her were gold and silver to the value of £1,000,000. When she was fewer than 900 miles from Cape Town (the Suez Canal was not then built), she ran short of coal. A gale was blowing, so all canvas was set and, helped by reduced steam, she sailed back to St. Helena, over a thousand miles away. She reached Melbourne at last, after a passage of eighty-one days. Later one mast and a funnel were taken from her rig. For many years, except when she served as a transport during the Crimean War (1854-56) and the Indian Mutiny (1857), she made voyages of between fifty-four and sixty-four days from Liverpool to Melbourne. After more than twenty years on this service, the Great Britain made her last trip in 1875. She was laid up in the Mersey until 1882 and then was converted into a sailing vessel, her hull being sheathed with wood and her engines removed. On a voyage to San Francisco in 1886 she put into Port Stanley, Falkland Islands, in a leaky condition and was condemned. She survived for nearly half a century as a hulk before she was broken up. She had the longest career of all the vessels on the Australian run. To-day there are hundreds of small vessels which can proceed under either power or sail. Had the internal-combustion engine been invented in the days of the inefficient steam engine, its effect on ships and on coal-producing countries such as Great Britain might have changed the course of history. The internal-combustion engine has enabled small sailing craft to survive where but for its aid they would long since have been scrapped. It is not difficult to install a low-powered internal-combustion engine that will give a sailing vessel a speed of about 5 knots. The auxiliary is to be found, therefore, in all parts of the world. She does not carry the huge bulk of the world’s freights in giant loads, but she can justify her existence. She sails into big harbours after the haughty liner and finds a corner for herself. She penetrates narrow rivers and shallow tidal creeks and lies alongside wharves at little ports that have neither the cargo nor the depth of water to offer a big vessel. WITH ALL SAILS SET, the Japanese four-masted barque Nippon Maru has her staysails set on three masts and her flying jib, outer jib and inner jib from her bowsprit. With her sister ship, the Kaiwa Maru, she was built at Kobe, Japan, in 1930. She has a gross tonnage of 2,250, and her auxiliary engines drive twin screws. Steam killed the big sailing ship, but the diesel engine has prolonged the life of the small sailing vessel. In industrial countries yachts are the only vessels now built depending solely upon sails. Unless yachts are intended for class-racing, as are the J Class yachts Endeavour, Velsheda, Rainbow and others, nearly all are fitted with an internal-combustion engine. This may be small in size and installed for use in calms, or it may have considerable power if the yacht was designed as an auxiliary. 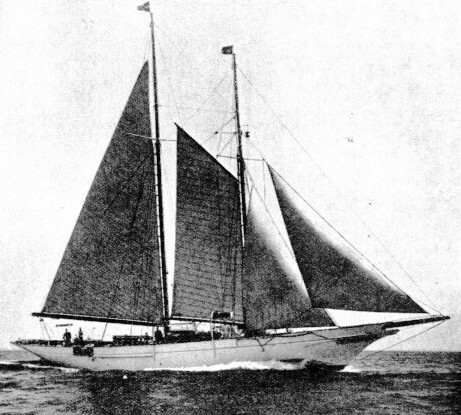 The trading schooners in the Pacific Ocean are now mostly fitted with auxiliary engines. They use their sails on occasion, but often the deck load is so large that the mainsail or foresail cannot be set, as there is no clearance for the boom. In the coral islands the entrance to a lagoon is narrow and reef-studded. The water rushes in and out with great force, according to the tide, so that a schooner provided only with sail has to be hauled through by natives with warps (towing ropes) from the shore. Equipped with an engine, a schooner can pass through without assistance. In islands that are not merely atolls, the harbours are often surrounded by cliffs and mountains, leaving a narrow entrance. If the wind is fair a sailing vessel can enter, but she may find that the cliffs and mountains prevent any true wind from helping her. THE FAMOUS GREAT BRITAIN was the first propeller-driven ship to cross the Atlantic Ocean. When she was built in 1843 she had six masts and two funnels, but later her rig was twice altered. Finally she had three masts and one funnel. She was the first iron steamship of any size (3,500 tons) and marks an important stage in the transition from sail to steam. So dangerous are certain of these harbours that in the days of sail the schooners did not venture into them, but hove-to and sent boats ashore. The sea outside is generally too deep for an anchorage and schooners were sometimes carried miles away. Nowadays the auxiliary schooner enters the harbour and anchors without trouble. The Kanaka, or South Seas Islands, engineer takes a pride in his engine, which is invariably a diesel or a semi-diesel. Lagoons are often so reef-strewn that navigation under sail would be a nightmare, but the engine enables the vessel to avoid the dangers without any bother. At islands where there is no harbour and no anchorage outside, the schooner can furl her sails and maintain her position against the currents while her boats put off for the beach. These schooners serve a useful purpose in world commerce, for they act as feeders to the great shipping lines. Their cargoes are discharged at a port on the routes between Australia and America, or between New Zealand and America, and are picked up by oceangoing ships. There is not enough freight at the outlying islands to warrant a large vessel making a special call. The auxiliary engine enables a schooner to go against the trade wind to the Pacific ports of America if the freight justifies the voyage. She need not go far out of her course to pick up the westerlies, and she can sail back before the trade wind. Large sailing vessels are still being built, with auxiliary engines, for training purposes. Many foreign nations insist that officers in their navies and their merchant services shall be trained in sail. They believe that sail-training develops qualities of alertness and resource in a way that no other form of training can bring out. They also take steps to ensure that the training ships are not floating museums of a vanishing age, but are fitted with modern equipment. A good example of an up-to-date training ship is the Brazilian auxiliary-engined four-masted barquentine Almirante Saldanha, designed for training cadets in the Brazilian Navy. She was built and engined by Vickers-Armstrong, Ltd., of Barrow-in-Furness (Lancs), in 1933. Her overall length is 305 feet, her moulded beam 52 feet, her moulded depth 28 ft. 6 in. and her displacement, in load condition, 3,315 tons. Her speed under diesel engine power is 11 knots and her fuel capacity gives her a radius of 12,000 miles. She has three decks, with a short forecastle, a long poop with fore-and-aft gangways between, a navigating bridge and compass platform. The Almirante Saldanha has sixteen transverse water-tight bulkheads and a double bottom extends from the forward bulkhead for 170 feet. The compartments thus formed are used for water ballast. The engine-room, which contains also the auxiliary boiler and distilling plant, is amidships, with oil-fuel bunkers and fresh-water tanks fitted at the forward and after ends. There is accommodation for twenty-five officers, one hundred cadets, thirty-four warrant officers and about 300 seamen. Her auxiliary engine is a four-cycle, single-acting, airless injection trunk-piston reversible diesel engine with six cylinders, developing 1,400 horse power when running at 190 revolutions a minute. This corresponds to a ship speed of about eleven knots. A clutch fitted on the line shafting enables the propeller to be disengaged from the engine so that it can revolve idly when the vessel is under sail and thus reduce the propeller’s drag. With four masts, four yards on the foremast, booms and gaffs on the main, mizen and jigger masts, a long bowsprit and jib-boom, the vessel has twenty sails which have a total area of 27,000 square feet. A MODERN FOUR-MASTED BARQUE, the German auxiliary Magdalene Vinnen, 3,476 tons gross, sailed from Port Jackson, Australia, round Cape Horn to Falmouth, Cornwall, with a cargo of 16,000 bales of wool. This is claimed to be a record shipment for sailing vessels. The Magdalene Vinnen, built at Kiel by Krupp in 1921, has a length of 329 feet, a beam of 48 ft. 2 in. and a depth of 26 ft. 8 in. The electrical equipment consists of generators, motors and control gear. The electrically-driven machinery throughout the ship was made by the Metropolitan-Vickers Electrical Co., Ltd. One of the stipulations was that all equipment should work satisfactorily when inclined fifteen degrees fore and aft or athwartships, to meet conditions when the ship might be sailing for long periods on one tack heeled over by the pressure on her sails. The bearings of the electrical machinery had therefore to be given special attention to meet this requirement. Denmark is another country that has a modern auxiliary training ship. The Georg Stage was completed in 1935 by the Frederikshavns Vaerft & Flydekok. She is a three-masted, full-rigged ship with a length of 124 feet and a beam of 28 feet. A vessel of 298 tons gross, she has a depth of 12 ft. 5 in. She carries 8,000 square feet of sail. Her engine is a two-cylinder diesel. 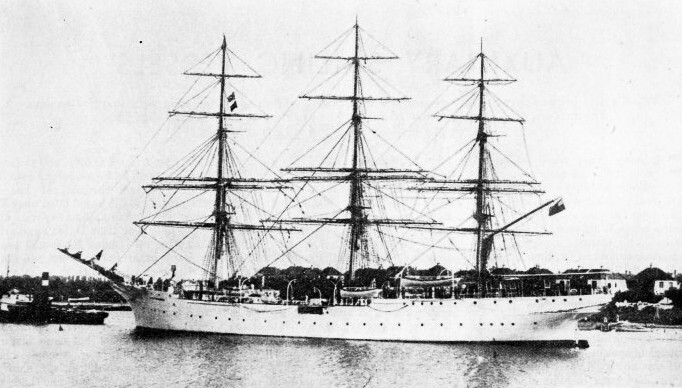 Many other foreign countries use auxiliary sailing vessels as training ships. Poland has an auxiliary three-masted schooner, the Iskra, of 560 tons gross. A larger vessel, the Dar Pomorza, 1,620 tons, a steel auxiliary ship, was built in 1909 at Hamburg. She has a length of 239 feet, a beam of 41 feet and a depth of 21 feet. Of the four Japanese auxiliary training vessels, the largest are the Nippon Maru and the Kaiwa Maru. These four-masted steel barques of 2,250 tons gross were built at Kobe in 1930 and have twin screws. Even larger are the Italian vessels, the Amerigo Vespucci and the Cristoforo Colombo, of 2,787 and 3,543 tons respectively. These were built during 1928-31, and equipped with diesel-electric drive whereby diesels operate generators which in turn supply the current to an electric motor on the shaft. Vessels thus equipped provide training for engineers as well as for deck officers. A 42 FEET MOTOR YACHT on the River Thames. The Peter Pan was built and equipped with two 18 horse-power diesel engines by John I. Thornycroft & Co., Ltd. She was designed for open-sea crossings, and under power alone she has a speed of nine miles an hour. Her sail area is 380 square feet. She has a draught of 3 feet and a beam of 11 feet. The Magdalene Vinnen is a German example of the big trading auxiliary. She is a four-masted barque registered at Bremen, and dates from 1921, when she was built by Krupp at Kiel. Her gross tonnage is 3,476, her length 329 feet, her beam 48 ft. 2 in. and depth 26 ft. 8 in. She has an auxiliary oil engine, electric lighting and a submarine signal system. 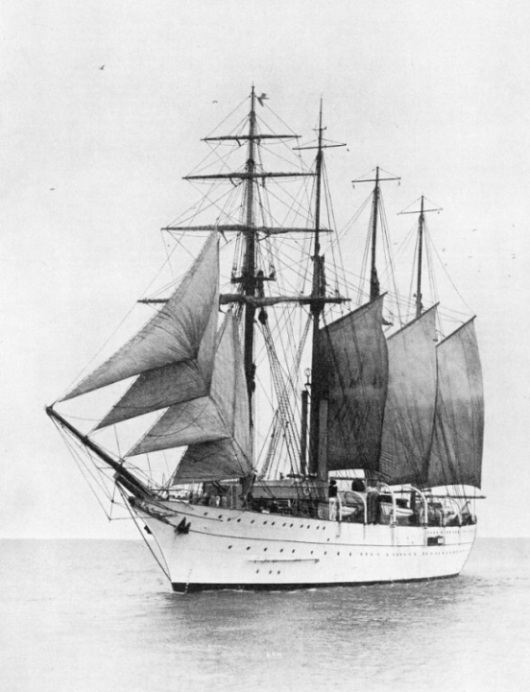 A five-masted vessel built about the same time is the Carl Vinnen, 1,827 tons gross. She is similarly equipped with auxiliary engines. Apart from such modern vessels there are many auxiliaries which are “old-timers”. Some of them, more than fifty years old, have been given a protracted lease of life by the diesel engine. These old vessels have seen steam displace sail, and the coal age give way before the oil age. They have seen the struggle for supremacy between the steam and the internal-combustion engine, with electricity allied to both. Not all the old warriors have changed over to the diesel engine. Some, though propelled by steam, are not auxiliaries, but “conversions”. The full-rigged ship Ainsdale, a proud vessel in the ’nineties, was converted to steam about 1918, and after having changed her flag more than once, survives as the Turkish steamship Kalkavan Zade of Istanbul. The Ainsdale was built at Londonderry in 1890. In 1917 she was so badly damaged by a German submarine that she was abandoned. She was salved, however, and converted to steam. 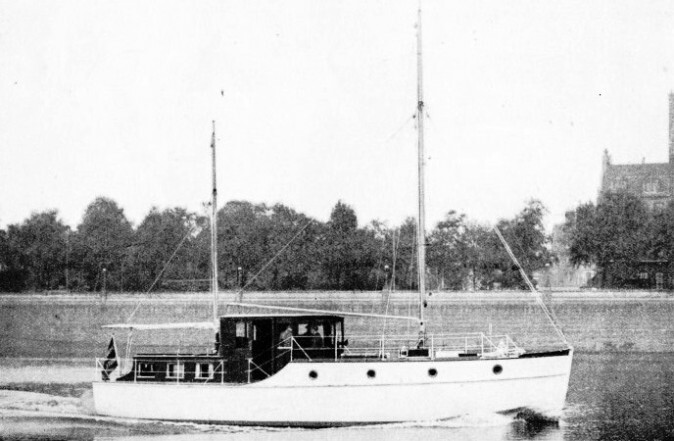 CONVERTED FROM A SAILING YACHT into an auxiliary motor vessel, the Charmian was equipped in 1935 with two A.E.C. 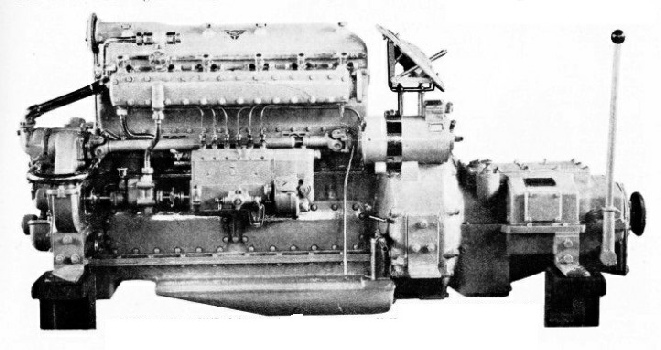 six-cylinder oil engines of the type illustrated below. 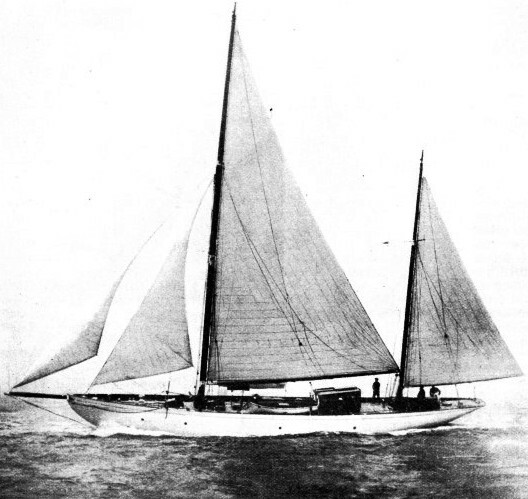 The vessel was built in 1896 at Southampton by J. G. Fay & Co. and designed as a yacht by J. M. Soper. The Charmian has an overall length of 125 feet and a beam of 23 ft. 6 in. She is a vessel of 175 tons. 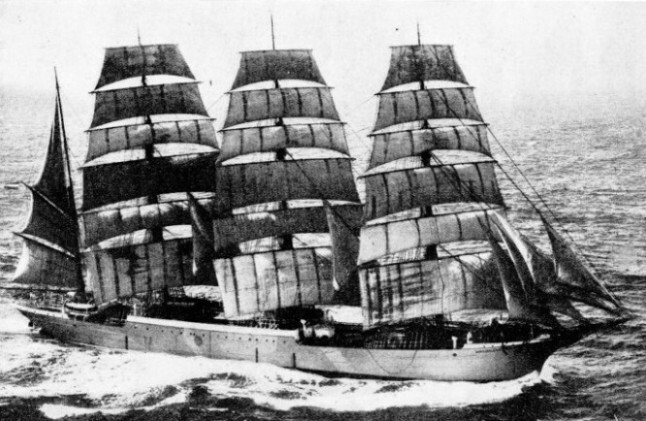 The Estonian steamship Nemrac was once the four-masted ship County of Inverness. The County of Inverness was built in 1877 and was owned for more than twenty years by R. and J. Craig, of Glasgow, who sold her to Shaw, Savill & Co., of London. The County of Linlithgow, built for Craig in 1887 as a four-masted ship, is now the Greek auxiliary Katherine. The Spanish steamship Bilbaino was once the British iron barque Delta, built in 1865 by Hill, of Cardiff, for the copper ore trade. The Dutch auxiliaries are numerous, and the Dutch shipyards evolved a type that at one time severely competed with British coasters, both sail and steam. The auxiliary of this type ranges from about 75 to about 250 tons and a diesel engine gives her a speed of about 9 knots. The owner is generally the Captain, and the crew of the larger vessels consists of a helmsman, three hands and a boy, who is the cook. These motor sailing ships are able to do all the work a Thames barge can do, and have a far better turn of speed on an average and do not have to wait for a wind. They are the motor lorries of the North Sea and some of them are floating homes as well. A MARINE OIL ENGINE of the type often fitted as auxiliary to sailing vessels. The port view of the A.E.C. six-cylinder engine illustrates the clean design and the convenient grouping of all accessories. This engine develops 100 brake horse-power. Two similar units were fitted to the auxiliary motor schooner Charmian, illustrated above. One of the oldest British vessels now an auxiliary is the ketch Ceres, which was built at Salcombe, Devon, in 1811 and rebuilt in 1865. Some years ago she was fitted with an auxiliary motor to enable her to keep her place in the coastal trade of southwest England. She has a tonnage of 44. Fishing boats are now either full-powered vessels or auxiliaries, although there are still a number of sailing smacks on the British coast, mainly at Lowestoft (Suffolk) and Brixham (Devon). Just as the big sailing trawlers and smacks of other days have given place to the steam trawlers and drifters, the smaller vessels have had to move with the times by installing motors. In recent years small diesels have been built for the smaller craft and are replacing the petrol-paraffin types that have been popular. Most of the engineering firms which make petrol-paraffin motors for marine use specialize in producing slow-running motors for small fishing craft. These engines start on petrol; when they have warmed up the petrol is turned off and the paraffin is turned on. The use of paraffin reduces fuel costs in Great Britain, although the power output is approximately only ninety per cent of that obtained from petrol. When an engine is used to such an extent as in these fishing boats the cost of fuel is a big item. The cost of fuel for a diesel is less than for a petrol engine, although the engine itself costs more to buy. For the most part the engines are installed in boats which retain their local characteristics. Every fishing port has evolved a boat suitable for its own locality and type of fishing. A Leigh bawley, for example, is different from a Yorkshire coble, although either may be equipped with an engine of the same make and power. The modern inshore fisherman is a sailor-mechanic-fisher-man, equally adept at sailing a boat, mending nets or taking an engine to pieces. Motors have altered this branch of the fishing industry considerably. They have extended the radius of small craft and lessened the perils of a dangerous calling. In a calm the fisherman can get quickly under power to and from the fishing ground. If he is caught on a lee shore by a gale he has a far better chance of getting off it quickly than if he had only sail. At the same time, the sail is useful to steady the rolling of a small boat and saves fuel when the wind is fair. Among small craft the marine motor has stimulated yachting and few cruising yachts are now built for sail only; nearly all are auxiliary vessels. The auxiliary may be a sailing yacht with a small engine as an auxiliary to the sails, or a sailing motor-yacht which is a motor-yacht with auxiliary sails. THE SAIL AREA of the 78-tons auxiliary yacht Halcyon amounts to approximately 2,500 square feet. The Halcyon, 79 feet long, with a beam of 17 feet and a draught of 9 ft. 6 in., is fitted with a 70 horse-power petrol engine which gives her a speed of 7½-knots. Designing a vessel which will travel as well under sail as under power is a problem that has attracted many naval architects. The most that can be expected, however, is a compromise. A sailing vessel, whether she is a little fishing boat or a full-rigged ship, is built to be propelled by the elements. From truck to keel she is designed to utilize the pressure of the wind and the resistance of the water, with modifications of rig and hull shape to conform to her work. The steam or motor vessel is designed to fight the wind and the water by being thrust forward by the action of her propeller. It is comparatively easy to place a motor into a sailing vessel and use it as an auxiliary to obtain a moderate speed. It is impossible to obtain the speed that would be developed if the same engine were installed in a vessel designed specially as a steamship or a motor vessel. On the other hand, modern steamships, motor ships and motor yachts are not designed to sail. The area that a big liner exposes to a beam wind, for example, is greater than the sail area of a full-rigged ship and the design of a motor yacht, with her shallow draught and high freeboard, will not permit her to be sailed to windward. In British coastal waters the most successful small sailing vessel is the Thames barge, which is still able to compete with steam and oil. There are, however, several Thames barges that have become auxiliaries, and have been operated successfully for a number of years as traders. The usual practice is to install the engine aft. A paraffin engine of 40 horse-power propels a barge 83 feet long, and a diesel of 100 or 125 horse-power propels a 95-ft. coasting barge. The auxiliary yacht has done much to make the pastime of cruising popular and to keep alive the art of sailing. Some owners of auxiliaries are always complaining of the engine, whereas the trouble lies with themselves. The tendency with a sailing boat into which a motor has been placed is to place the engine in such a position that everything is against its efficient working. Petrol engines are often installed under the raised floor of an open well, and then neglected and exposed to damp, but they are expected to function as well as the engine of a car that is housed in a garage. To avoid the drag of the propeller when the yacht is under sail, several methods are employed. One is to have a two-bladed propeller that is kept vertical in the orifice in line with the sternpost, the fly-wheel of the engine being marked to denote this position. Another is a patent feathering propeller. Yet another method is to allow the three-bladed propeller to idle and to revolve with the pressure of water; it can be thrown out of gear with the engine by using the clutch. A development of the auxiliary among small boats is the improvement of the outboard engine. Outboard engines are clamped on to the transoms of small craft. They average between two and five horse-power, and are employed for a variety of purposes from propelling a dinghy to acting as the auxiliary of a small sailing yacht. They work on the two-stroke principle, and some models that develop appreciable horse-power at high revolutions give to specially-built boats speeds exceeding that of an Atlantic liner. This can occur only in smooth water, as the craft are not displacement boats but hydroplanes. A noteworthy development of the auxiliary is the application of the petrol engine to a former ship’s boat. Many years ago men with sea-fever in their blood but no cash in their pockets bought boats that had been used as ship’s lifeboats and tried to sail them. A few succeeded in converting such boats into craft that had a cabin and could sail to windward, but the percentage of failures was enormous. Mechanically-minded men solved the problem of getting to windward by equipping such boats with motor-car engines. These were converted to marine use, and the vessels retained their sailing power. Some of these craft are former cutters, whalers and pinnaces which in their prime belonged to the Royal Navy. A few were formerly lifeboats of the Royal National Lifeboat Institution. These craft exist in every port on the coast and in places on rivers many miles from the sea. Each “conversion” is a true auxiliary in that she is neither a yacht nor a motor yacht; each reflects the individuality of the owner. A STEEL THREE-MASTED SHIP, the Dar Pomorza, is used as a training ship in the Polish Navy. She has a gross tonnage of 1,620. Ths Dar Pomorza was built at Hamburg in 1909 and is fitted with auxiliary engines. Her length is 239 feet, her beam 41 feet and her depth 21 feet. You can read more on “Great Voyages in Little Ships”, “Speed Under Sail” and “Training in Sail Today” on this website.